Firstly let us all congratulate the RBI for buying 200 tons of Gold from the IMF. This is a clear sign that even the RBI has got to know what we have been talking about for quite sometime now. It is high time we move our Forex away from dollars into gold and also spend it on developing infrastructure. If you are an NRI – this is the best time to exit your Pound/USD/Euro holdings and invest in into INR assets - equities being much safer than property, which is still an inflated bubble waiting to burst or even just keeping it in a Rupee FD. We can see the rupee becoming stronger and more secure as our gold holdings keep going up. Now whenever there is a major sale of Gold in the world, the first thing they will do is come and knock on our door and ask us if we want to buy. It is also an excellent time to get ready with funds to benefit from the coming crash. After our last post, I got lots of e-mails and phone calls from people asking me about which company I was talking about. I rarely share such companies in a public forum, because it leads the stock rallying too much. This doesn’t allow me accumulate the stock for my personal portfolio as well as a private fund which I manage. As the company isn’t too big, even an infusion of only Rs. 25-30 crores would cause major movements in the stock price. I want to stress on the fact, that the coming crash will provide an even bigger opportunity than the last crash we had and as an individual investor you can benefit much more than a big Mutual Fund or Pension Fund. Any individual with less than Rs. 5 – 10 crores in investable money can easily get 50% returns on an annualized basis in the long term. This isn’t something just what I am saying, but is something even the world’s richest man, Mr. Warren Buffet agrees with. This is a fact which is mostly not known to the masses. The fact that smaller sums of money can give more returns than larger sums of money is rarely something that is taught. Neither students of finance – nor potential investors in Mutual Funds are made to be aware of this fact. 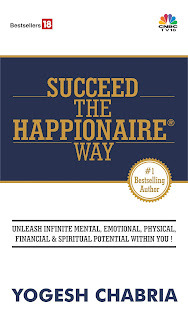 I had talked about this phenomenon even in Invest The Happionaire™ Way. It becomes very difficult to give extra ordinary returns, when you are a large Mutual Fund and have Rs. 50,000 crores under management. You can in no way benefit from say a mid-cap company having a market value of Rs. 2000 crores no matter how undervalued it is. On the other hand if you manage a small private fund of only Rs. 100 crore you can easily make the most of the opportunity by even putting 10% of your capital – i.e. Rs. 10 crores. If you have anything less than Rs. 5 crores in investable capital, ask yourself if you have made at least 50% on an annualized basis in the past years? If you haven’t, try thinking about what steps you take to make it happen. Over a period of ten years – imagine the immense change those type of returns can bring to your financial position when compounded. Our future wealth depends on the decisions we take today. I want each one of you to believe in yourself and make sure that this time you make the most of the opportunity coming our way. The crash (globally) will be massive and will be talked about for years to come. In the midst of this, it is our job to discover hidden opportunities in India. Never feel that the money you have is too little – the biggest trees and forests start out as small seeds. All you need to do is make sure you plant those seeds – and regularly water them with knowledge. Nice point of view. But my question is what if someone is just not having all the knowledge that people like you or Warren Buffett or other investors who started investing very young have? How can we benefit immediately from the coming crash? I am 42 and know that I missed the opportunity in the last crash, in spite of you telling people like me and even writing an entire book on it (Cash The Crash). To plant those seeds we need to know many things, what type of soil, how much to water, amount of sunlight needed, how to avoid pests, what fertilizers are needed. I sent you an e-mail Chabriaji, I want to know how I can make you my gardener and make sure my seeds are well taken care of? Please accept my humble request of your follower and great fan. I want to know how I can be a part of your fund and invest with you. Thanks for sharing the knowledge of Gold. I was shocked and happy today morning when I read the headline in the Mint. It said that the RBI was buying 200 tons of Gold and that is when I immediately remembered what Yogesh had said to all of us here. His prophecy is coming true. Keep guiding us. what is this small company all about?educate all happionaire. What a lovely article filled with knowledge. Thanks so much for making small investors like me realize our power. "It is not that the U.S. is going to drop in the sea and disappear, its just that the next big round of growth is in asia and not the west-Jim Roggers", Disney coming to shanghai I am sure it will soon come to India, I feel our generation and the next two have a great life ahead but I feel we must thank our ancestors who worked hard and saved, because of which we have no debt or hardly any debt, so we can invest our own money and make more money. Its really a Great news. i felt happy when i came to know that RBI is also buying bullions.. Its good our economist also have sence..
hi yogesh which Pvt. fund do you manage ? i want to invest in that. It Looks like what you're saying is right. Am glad after making a mistake of buying at highs, i got chance to take my money out no losses. Am still invested in those co's where i have invested for long long long term. I can literally see you shouting and shaking everyone that plz don't make mistake....book profits and get ready with funds....you're going to get a life time opportunity to sow seeds. All Happionaire's Read this article, We should see it coming. Make sense of it and realize that one of the biggest crash is coming our way. Soon it'll be time to cash the crash. Ok, Here goes another story. Hope everyone is liking it. Not sure how relevant it is here; but worth sharing with all happionaire's. One old man was sitting with his 25 years old son in the train. Train is about to leave the station. All passengers are settling down their seat. As train started young man was filled with lot of joy and curiosity. He was sitting on the window side. He went out one hand and feeling the passing air. He shouted, "Papa see all trees are going behind". Old man smile and admired son feelings. Beside the young man one couple was sitting and listing all the conversion between father and son. They were little awkward with the attitude of 25 years old man behaving like a small child. Suddenly young man again shouted, "Papa see the pond and animals. Clouds are moving with train". One couple was watching the young man in embarrassingly. Now its start raining and some of water drops touches the young man's hand. He filled with joy and he closed the eyes. He shouted again," Papa it's raining, water is touching me, see papa". The couple couldn't help themselves and ask the old man. "Why don't you visit the Doctor and get treatment for your son." Old man said, " Yes, We are coming from the hospital as Today only my son got his eye sight for first time in his life". Moral: "Don’t draw conclusions until you know all the facts". I've been a follower of your blog for long and have noticed one after the other your predictions coming true. The Crash and after that the rally and then buying Gold and now predictions of another crash. Continue sharing your knowledge with all your followers here and let me congratulate you for doing this wonderful service. I have also sent you an e-mail to find out more about your private fund, if possible please accept me. Lovely post and also loved the story by Ravi. It is a pleasure to share such lovely ideas. Chabria Sahib, I have sent you a personal e-mail regarding Rs. 75 lakhs that I got from selling some property. Please let me know if I can invest this in your private fund. I do understand you must be busy, please look into it. I am still learning and don't want to miss out any opportunity that will come from the crash now. Most of the educational reports shared by you are around one and a half years old. Would it be possible to get your updated views on them? This could help us learn how by time/events opinions and views may change. And what should be monitored after we have made investments for the long term. Chabria Sir, your prediction on gold has been amazing. I remember the time when you so confidently told all of us Happionaires to buy Gold and today it has been a blessing for us.I remember a few people questioning you logic, and all you said was that time will prove who is right or wrong. I know you must be very busy, but please why don't you do some TV show for us? Even once a month will be superb. You can talk to us about not just investing but also the life. One more of your huge fans.